Just because I could, I tossed in some CB's Nuts Roasted Pumpkin Seeds too. CB's Nuts happens to be local, and I've driven by several times when visiting my sister, so I was excited to be given a package of their products at an event at Whole Foods! This is a small company with a great mindset. They roast in small batches, to ensure quality. Theirs were one of the few peanuts not recalled when there were those peanut/peanut butter recalls - they roast in a way that kills off harmful bacteria like Salmonella. While at Whole Foods, I found out that for their roasted pumpkin seeds, rather than wasting pumpkins to get the seeds, they buy the seeds that are being discarded by pumpkin canning companies (and companies that make whatever else pumpkins might be used for...) I can't remember exactly, but these are either seasonal or a Whole Foods exclusive product. Or both. Lucky me! 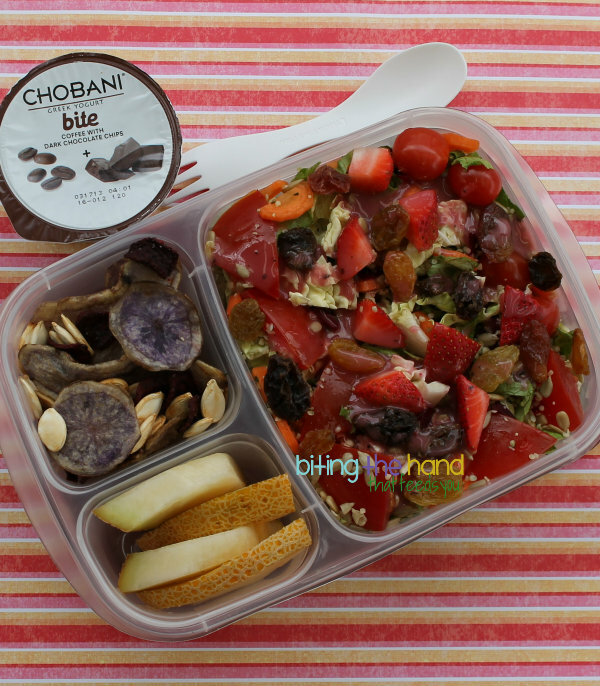 The Light My Fire spork was perfect for this lunch, since I needed a fork for the salad, and a spoon for the Chobani Bite Coffee With Dark Chocolate Greek Yogurt! 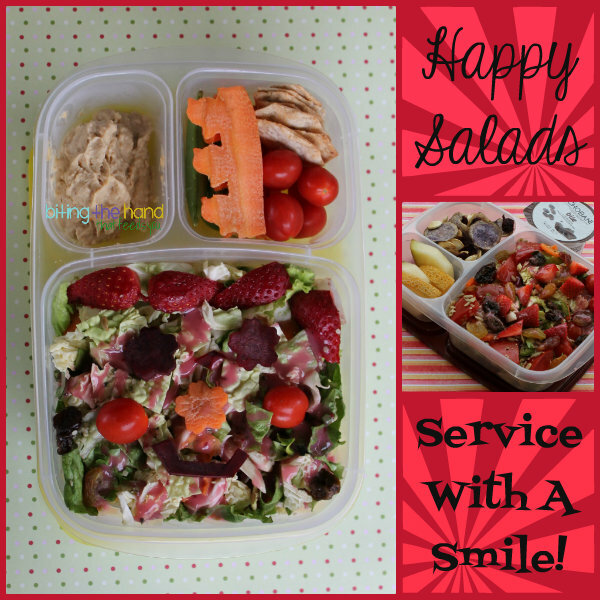 Wednesday, 3/20/13 - Happy Salad! This design was a spur-of-the-moment thing. I had the beet and carrot flowers (cut with a sakura flower veggie cutter) already made, but as I was placing them on, they kind of looked like eyes and a nose. So I cut a beet-scrap into a mouth, added rosy grape tomato cheeks, and one lone wilty strawberry cut up for hair. Done! The chickie carrots (cut with a baran cutter set) were leftover from Z's chickie lunch. I'm not sure why she didn't eat them. Normally it's because something is too cute, or she humanizes it and says it doesn't want to be eaten, or you can't eat it on it's birthday, etc. But she had no answer for these ones. But overall I still have better luck getting her to eat carrots that are cut fancy in some way, versus coins or sticks. LOVE strawberry season! 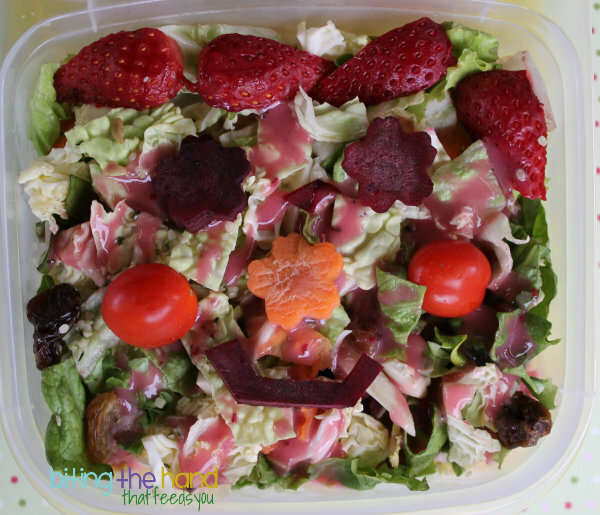 Your salad looks beautiful and delicious. You should try freezing that flavor of Chobani. 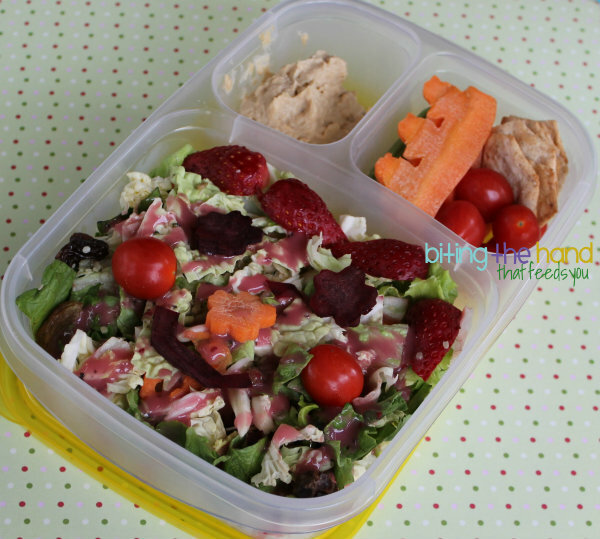 I did that for my kiddos yesterday and it was like a healthy ice cream treat!